Doggie Brain Training: Teach old dogs new computer game tricks, say researchers – FIREPAW, Inc.
New research has shown that to keep older dogs mentally agile and fit, look to teaching them computer games. (“Using simple tasks that can be solved through touchscreen interaction, followed by a reward, even old dogs remain willing to learn.” ) In the study, the older dogs, like younger humans, really took to the computers and actually became avid gamers. We can just see the national contests and television specials now. Researchers are currently working to make these dog-friendly computer games available for consumers for home use. Spoiling old dogs in their twilight years by retiring them to the sofa and forgiving them their stubbornness or disobedience, doesn’t do our four-legged friends any good. Regular brain training and lifelong learning create positive emotions and can slow down mental deterioration in old age. Physical limitations, however, often do not allow the same sort of training as used in young dogs. In a new study, a team of researchers led by cognitive biologists propose computer interaction as a practical alternative. 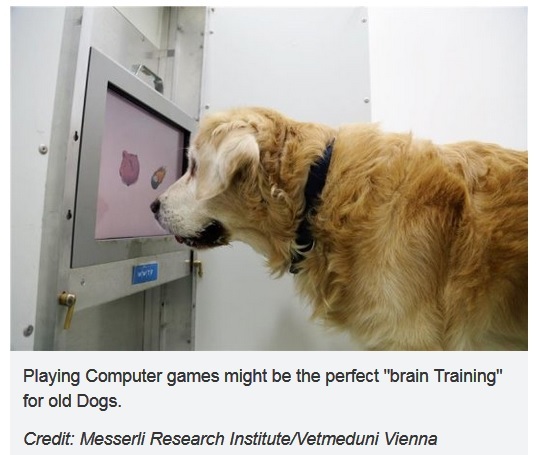 In the training lab, old dogs responded positively to cognitive training using educational touchscreen games. The aim now is to get the interactive “dog sudoku” ready for home use. Lifelong learning is not just good for people, it is also good for dogs. Dogs are capable of learning even in old age, and constant brain training and mental problem-solving create positive emotions and slow the natural pace of mental deterioration. Unlike puppies or young dogs, however, old dogs are almost never trained or challenged mentally. Senior dogs are usually perfectly integrated into our lives and we often forgive them any disobedience or stubbornness. In addition, due to their increasing physical limitations, we usually spare old dogs the sort of training we might expect from young animals. Cognitive biologists from the Messerli Research Institute at Vetmeduni Vienna propose computer games as an efficient alternative. Simple mental tasks on the computer, combined with a reward system, can replace physically demanding training and still keep the animals mentally fit even in old age. Under laboratory conditions, the training works using computer-based brain-teasers. It does take some preparation to get the dogs used to the touchscreen, but once the animals have got the trick they turn into avid computer gamers. The research team hopes that this study will not only motivate technicians and software developers, but also interested dog owners, to consider future cooperation.